I'm a sucker for Victorian fashion, the sillier the better - and it's hard to beat the Victorian crinoline for ingenuity, ridiculousness, and sheer presence. So I was pretty excited to get my hands on a shiny new copy of Crinoline: fashion's most magnificent disaster. Co-authored by Denis Pellerin and Dr Brian May (yes, that Brian May - no stranger to extreme fashion himself), Crinoline documents the rise and fall (metaphorically!) of this most capacious of undergarments through a rather unexpected record - stereoscopic images. It's a sumptuous boxed set, containing a richly illustrated history and a stereoscopic viewer (designed by May, patent pending). This nifty little fold-up apparatus allows you to see the images in the book in 3D, as they should be viewed. The second work by the pair on this subject, the book is meticulously researched and very readable. Through 3D images and other documentary history, we get a real sense of the outrage, amusement, and titillation the undergarment caused in Victorian "social media" - cartoons, pamphlets, periodicals, and that hugely popular parlour entertainment, the stereoscopic viewer. 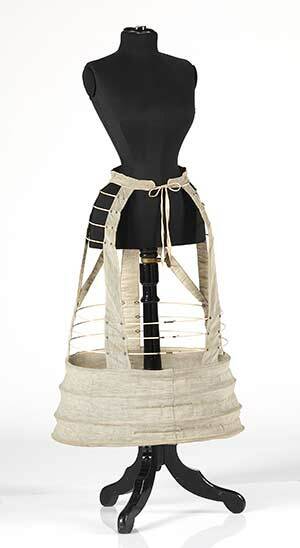 The crinoline was actually a huge (sorry!) improvement on previous womenswear fashions, replacing the layers of heavy petticoats needed to achieve fashionably bell-shaped skirts. Its lightness and ease of movement was a liberation (and also an excellent personal space generator - I can attest to this, having worn a couple to fancy dress events). However it also had its hazards: there were many cases of women being horrifically injured, or even killed, when their crinolines caught fire, became caught in trams, or suffered other wince-inducing vehicular mishaps. When I first came across mention of Crinoline, I thought the combination of topics could be a little forced or gimmicky, but this really isn't the case. Pellerin and May have actually hit upon a very real convergence of two tremendously popular coexisting technologies that, when looked at together, provide a vivid and altogether fascinating glimpse of Victorian fashion and attitudes.